Fire extinguishers are designed to fight Class A, B, C, D, K Fire Types, this means each fire extinguisher is designed for a specific use or special fire hazard. For help in determining which fire extinguishers to purchase for the fire hazards present in your home, office or workplace contact your local fire marshal or a qualified and licensed fire extinguisher company in Toledo, Ohio. When buying a fire extinguisher its a great idea to ensure the fire extinguisher has been reviewed UL / ANSI / FM stickers (Clearly visible on manufacturer’s label) help ensure the fire extinguisher has been reviewed and rated for performance. By shopping qualified, factory trained, certified, actively licensed fire extinguisher companies in Toledo, Ohio you may obtain estimates that will detail the costs to replace, purchase, service or maintain fire extinguishers. If you have a large company, retail or wholesale store chain, franchise, government or state agency you may qualify for volume discounts on large quantities of extinguishers that require replacement, purchase, recharge, refill, service, inspection, annual certification tag or (6) six year maintenance of installed fire extinguishers in Toledo, Ohio. Purchasing a portable fire extinguisher for your Toledo office is an important step toward protecting your building from fire. At Federal Fire Equipment Co., we want to provide you with the most effective fire extinguishers you can buy. Before you buy a fire extinguisher, it is important that you do your research so you can determine the best type of extinguisher for your building. Keep your building safe—purchase your fire extinguishers in Toledo, New Jersey today by calling Federal Fire at 419-531-5164 or filling out the form to the right. Federal Fire Equipment Co. has a number of different fire extinguishers available for purchase designed to suit a variety of different situations. If you are ready to purchase a new fire extinguisher for your home or office building, call Federal Fire Equipment Co. today. Having a fire extinguisher that doesn’t work is just as bad as, or worse than, not having one at all. That’s why it’s important to have your fire extinguishers replaced if they are ever damaged, cracked, dented, or rusty. A professional fire protection technician from Federal Fire will inspect your fire extinguishers for any outward signs of damage to the fire extinguisher shell, hose and nozzle. If we find any, we will replace your extinguisher. Fire extinguishers usually have big letters on the sides that indicate the class of fire they are designed for. It is imperative that you choose the right type of extinguisher—for instance, you would never want to use a class A-only fire extinguisher (usually filled with water) on a class C electrical fire. In general, most business owners throughout Toledo choose ABC fire extinguishers, which are suited to put out nearly any fire that normally occurs in an office or commercial building. The size of the fire extinguisher that you will need is dependent on the hazard class of your building. Fire extinguishers come in various sizes and the most common are 2.5, 5, and 10 pound. Our extinguisher technicians will evaluate your building layout and occupancy and recommend the most effective extinguisher for your building or equipment. There are many technical aspects to consider when purchasing an extinguisher that the average layperson will not be able to consider without a lot of research. Our technicians are trained to assess your building and select the proper extinguisher for your specific application. ABC dry chemical fire extinguishers, also called multi-purpose fire extinguishers, use a specially fluidized and siliconized monoammonium phosphate dry chemical. Commonly purchased in office buildings, they are appropriate for most common types of fire, including wood, paper, and plastic fires, as well as flammable liquid and electrical fires. ABC fire extinguishers work by either melting on and smothering Class A fires or absorbing heat and breaking the chain reaction of Class B and C fires. Often purchased for use by oil, gas, chemical, and utility companies, Purple K dry chemical fire extinguishers use a purple-colored siliconized potassium bicarbonate dry chemical that is electrically nonconductive and is extremely effective against Class B flammable liquid fires and Class C electrical fires. Using a cloud of white carbon dioxide “snow,” CO2 fire extinguishers remove heat and quickly smother Class B and C fires without any messy residue. CO2 fire extinguishers quickly cool down flames and can reach and exterminate even hidden flames. CO2 fire extinguishers can be used safely on all electrical and electronic equipment with no risk of electric shock to the extinguisher operator or damage to devices. CO2 fire extinguishers are not recommended for use against Class A fires, as the speed of the discharge is likely to cause flaming materials to blow away, potentially spreading the flames. Designed to supplement a kitchen fire suppression system, Class K kitchen fire extinguishers contain the liquid fire suppressant and are designed to knock down flames, cool down grease, and form a vapor securing blanket to prevent further fire outbreaks. Class K fire extinguishers are usually purchased for food-service establishments such as restaurants, convenience stores, food courts, and cafeterias. control rooms, laboratories, and hospitals. If you want to purchase a new fire extinguisher for your Toledo business, call Federal Fire today. Federal Fire is a large distributor of fire extinguishers and offers the most competitive prices from a variety of manufacturers. 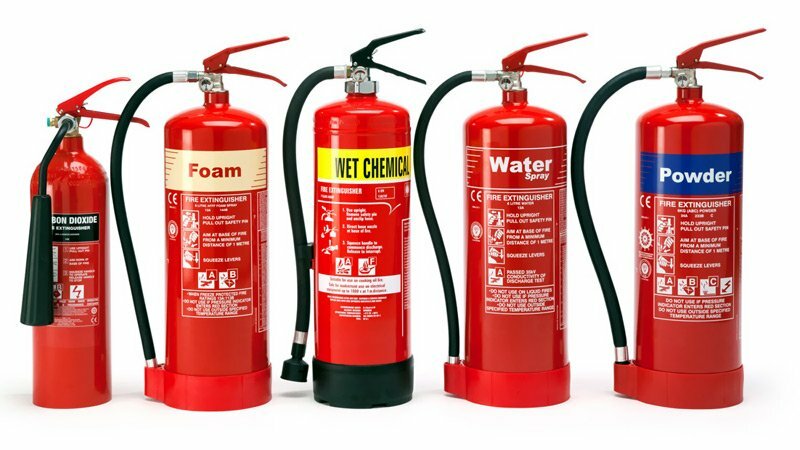 We can help you choose the fire extinguisher that’s right for you so you can make sure your building and equipment are fully protected. Federal Fire has over 20 years of experience providing complete fire protection services for businesses, organizations, government buildings, and restaurants in Toledo, OH. Our number one focus is your safety—we want to make sure your employees, property, and valuables are safe from the dangers of potential fires. We take pride in our “customer first” reputation, and we will do whatever it takes to make sure your property and valuables are protected from fire hazards and that your building meets fire safety codes. This Website Designed, Hosted, and Maintained by Toledo Computer Repair.